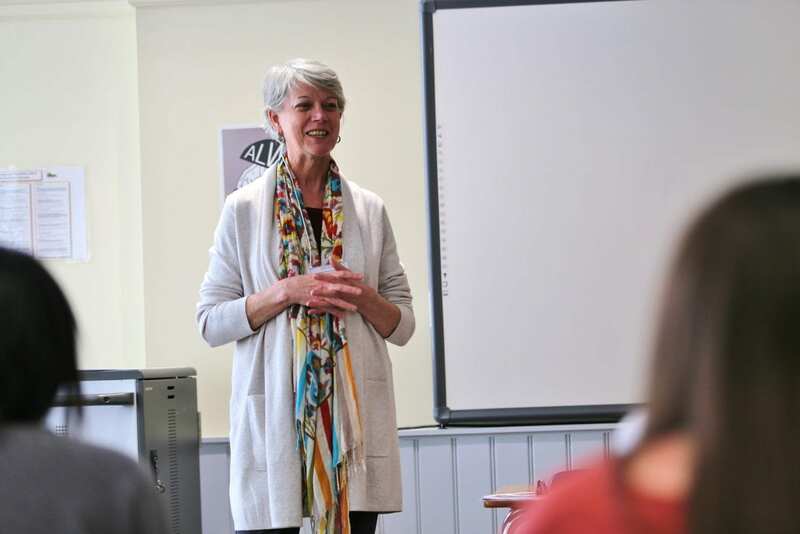 On April 11, Diane Randall, Executive Secretary of the Friends Committee on National Legislation (FCNL) visited the Upper School Leadership class to speak about her role as a leader and a lobbyist for the Quaker non-profit. Diane explained what it means to be a non-partisan Quaker lobbyist, how she leads in her role with the FCNL, and how Quaker practices tie into both her leadership and work. A lobbyist, as defined by Diane, is a person who shares information and works to influence an elected official; lobbyists’ goal is to advance policy positions based on public interest. In the case of Quaker lobbyists, the issues lobbied are selected through Quaker consensus from a semiannual poll of the Quaker community. In working as a lobbyist, Diane came to understand that there are three fundamental components of her leadership – a willingness to step up or speak out, a capacity to carry hope and have a vision, and commitment to compassion and a sense of duty to humanity. In working with the Quaker community, Diane found that there were fundamental Quaker principles which tied into the way she led and into the way that the community allowed her to lobby for them: discernment, which allows everyone to come to unity on a decision; trust, which is necessary for both consensus and in allowing the FCNL to work with politicians toward the goals of the greater group; and deep listening, to truly hear what peers and community members are saying. Click here to read a biography with more details about Diane’s work.